It's been almost nine months since we first reported on Windows Vista's inability to copy, delete and move files without stalling indefinitely, and yet the problem continues. Screenshots relayed this week by two Reg readers say it better than we ever could. "48167 Days and 23 hours remaining," one of them reads. 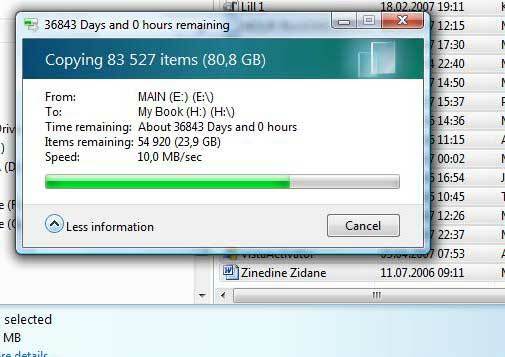 "36843 Days and 0 hours remaining," states the other. Both are Vista's best-faith guesses as to how long it will take to copy data from one location to another. "I have been experiencing slow copying ever since I 'upgraded' to Vista earlier this year, particularly from USB keys & drives," writes Adrian Procter, the Reg reader who provides Screenshot 1 (right). When Procter tried to create a CD with just 168Mb of pictures, Vista told him it would take more than 131 years to complete the job. So he canceled the job and used Nero 7. The task was completed successfully in a couple minutes. Both CDs came from the same package and he's never had an error writing to CDs or DVDs before. His laptop, by the way, has 1.25 GB of RAM, 15 GB of free hard disk space and runs on a Centrino Pentium M740. Vista's Long Goodbye, as we've come to call this bug, is one of the more baffling things to come out of Redmond in recent memory. Copying files to a CD or across a network is not exactly one of the more exotic things a PC user can do, right? And yet, the problem continues. Even stranger, Microsoft has yet to acknowledge the problem, other than to issue this hotfix, which many users say does nothing to remedy the bug. We kept our fingers crossed that the glitch would be straightened out with Service Pack 1, but even after the update is installed, many users are confounded to learn that the problem still persists. Reg reader Tonya is among them. "I have just installed the pre-release version of SP1 for Windows Vista after their website promised me in glowing terms that the file copying wait would be much reduced," she wrote. "Apparently not, as you can plainly see by the enclosed screenshot" (right). To be fair, some participants on this monster, 478-post thread on Microsoft's TechNet site have reported success in eradicating the Vista malady. Some report SP1 does speed things up. Others have seen improvements after running through a series of steps that includes disabling Windows search service, tweaking Vista's user account control settings and setting network interface cards at half duplex or auto negotiate.